A quick post today, I've been playing web designer all night, it's going slow, but progress is being made. For some reason I started with the Disneyland Guides that were handed out at the main gate. You'd think I would start with "tickets"? Oh well, I knew my guide collection was almost complete so it seemed like an easy place to start. I am only missing three guides; Fall/Winter 1970-71, Spring 1978 and 1994. 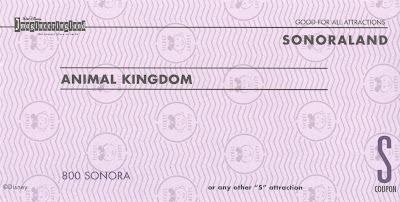 Please let me know if you might have one of these. Sample's are posted on the website, but they are super low resolution. Realize this is just a working draft, nothing fancy, although it wont get much more fancy anyway... I thought it would be fun to share all the guide covers, I've posed about a third of the guides in PDF form so far here on the blog. 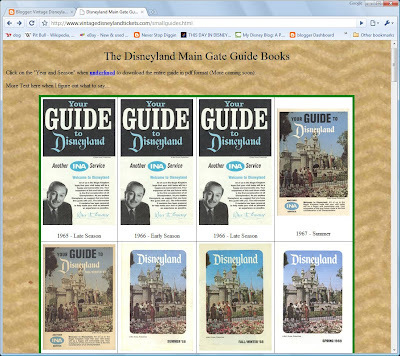 I don't plan on scanning every guide anytime soon, so keep checking back at the blog for those types of posts. Link to "The Guides" page on the website. 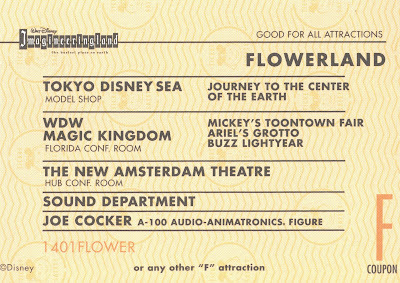 Looking back to last months post “Imagineeringland Today - November 15 & 16, 1997” (link) today’s post is a ticket book which I believe was part of that event. Here’s the map from the previous post, all the “lands” seem to match up with the tickets in the book. 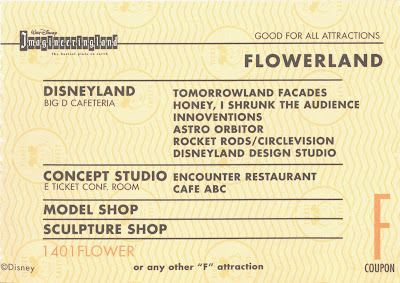 Not exactly A thru E tickets, but still a great tribute to Vintage Disneyland Tickets. 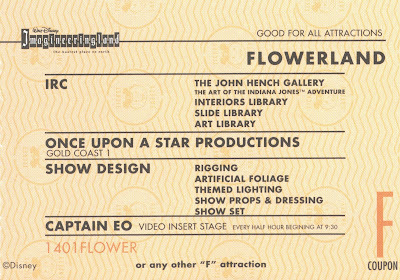 This is a “14 Adventure” book, with a bonus ticket at the end for a free photo and free (very cool) pennant. It’s also not “Globe Safety” paper, but its close enough for me with the wavy lines and fun faces. 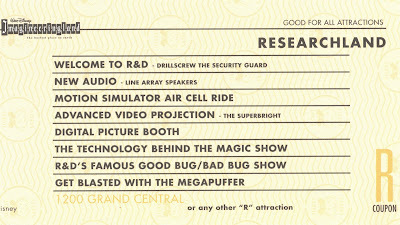 Presented in order are the "C" thru "T" tickets. 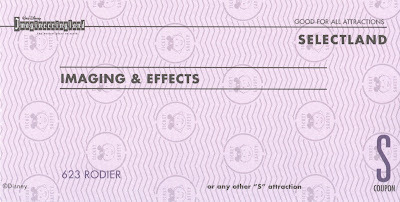 Of all the ideas that should have been scrapped, the ones on this “C” ticket top my list! A light post today, I've been busy working on the website. No noticeable progress yet, I've discovered my filing system for all of my scanned files is a mess, not to mention some of my early scans are pretty bad so I have to re-do them. Look for an update later this week. Welcome to magazine Monday. 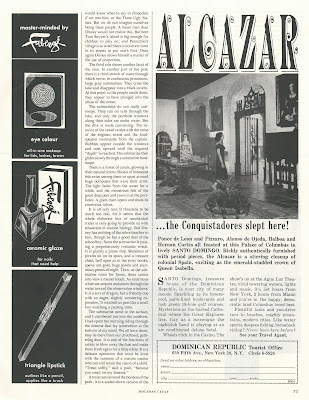 Today’s featured magazine is from the “this just in” department. Having never heard of “Holiday” magazine, I wasn't sure what to expect when this arrived last week. 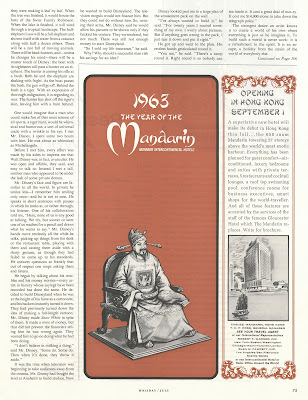 Lucky for us it’s a great vintage “Camelot” era “Life” sized travel magazine, and it’s in super shape too! 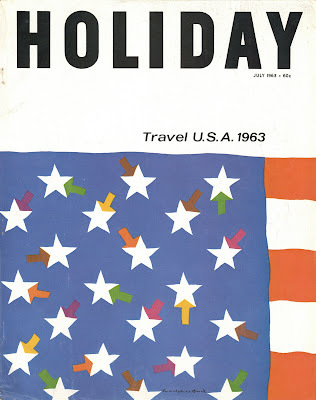 Holiday Magazine - July 1963. 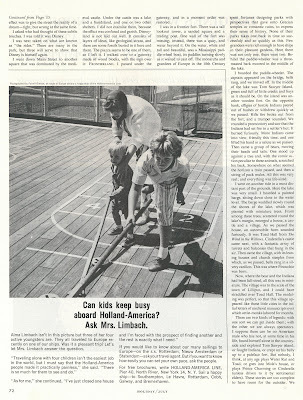 There’s only one photo of Disneyland in the entire article. The lengthy text more than makes up for the lack of photos. 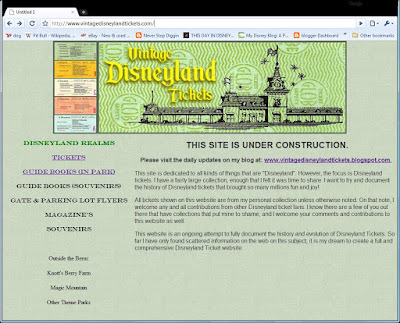 The author, Aubrey Menen, seems a little schizophrenic, he can’t decide if Walt’s Disneyland is a masterpiece or a jumbled mess. 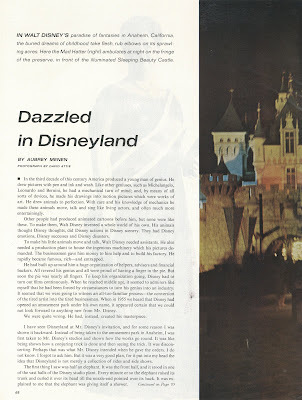 This article is unlike the others I’ve posted in a few ways, the author gets behind the scenes looks at the studio and after hours at Disneyland. I attempted to merge the two sides of the photo together, it came out OK. 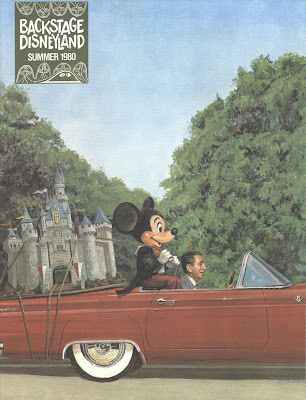 Check this out: the author got a sit down interview with Walt Disney himself. My favor quote from the author regarding Walt: “Mr. Disney’s hands move restlessly all the while he talks, picking up things from his desk or the restaurant table, playing with them and casting them aside with a sharp gesture, as though they had failed to come up to his standards”. I knew there was a reason I love Walt! 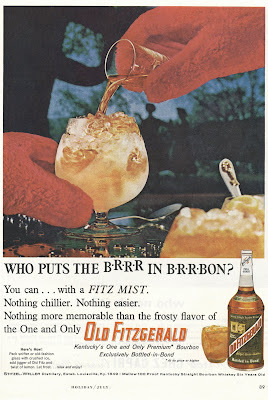 There is an amazing quantity of quality advertisements in this oversized travel magazine, so I hope you like old ads, because here are 16 of them! Believe it or not I had to leave a few good ones out, maybe I’ll throw them in on Bonus Sunday. Automobiles for your travels. 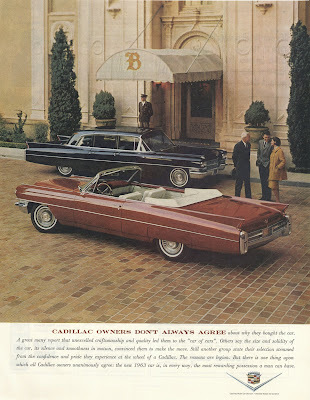 Up first, Cadillac of course. Nice convertible and formal limousine. 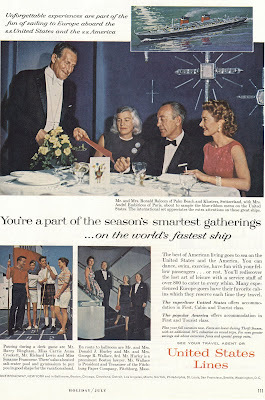 The smartly dressed couple are asking the chauffer if he’ll race for pink slips! 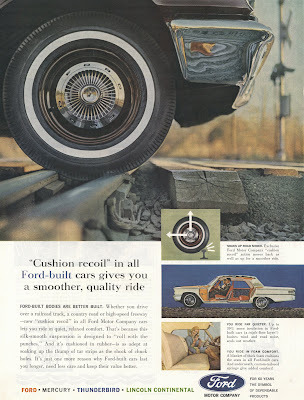 Buy a Ford because the of the new “Cushion Recoil”… Just sound like springs with rubber insulators to me. Chrysler is absent from this issue, maybe a sign of things to come? 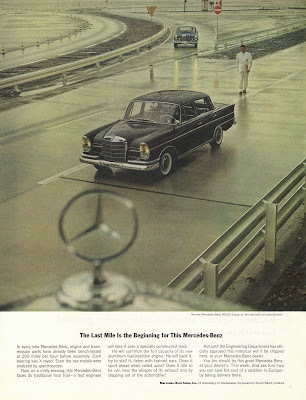 Oh well, Mercedes Benz took out a full page ad, definitely a sign of things to come. 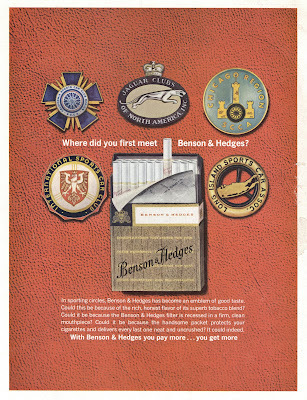 “A Subsidiary of Studebaker Corporation”, say what? 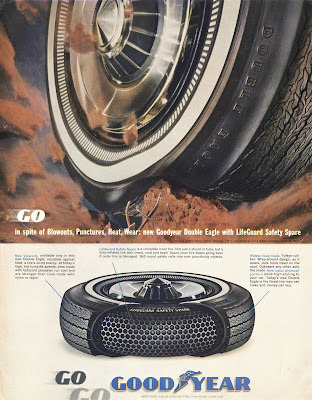 1963 and they had some pretty darn cool run flat tires, it's almost James Bond-like. 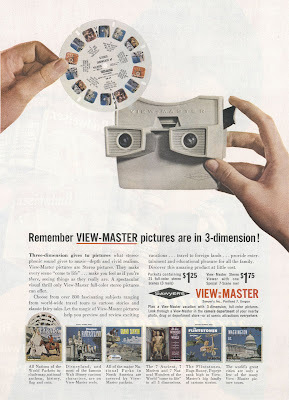 ViewMaster! Boy the slides on that reel sure look vivid. 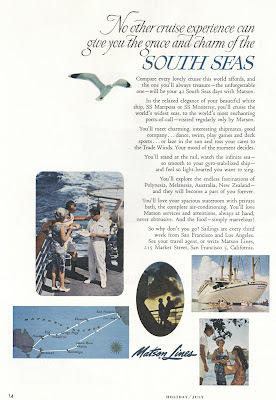 Here are a few cruise ship ads. This first one instantly reminded me of Pacific Ocean Park, what fun art work! 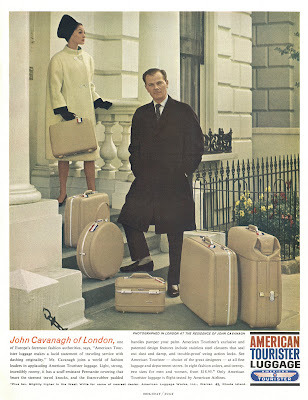 You’re going to need some stylish luggage for all your world travels. 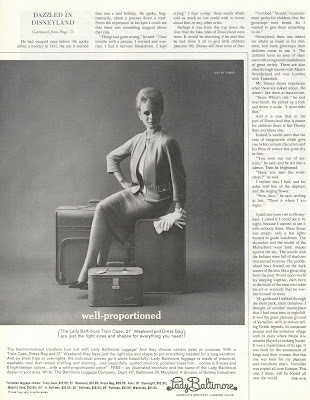 The lady is mega elegant; I hope they are going first class. 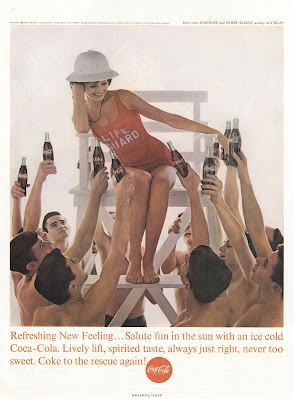 What a great Coke ad! 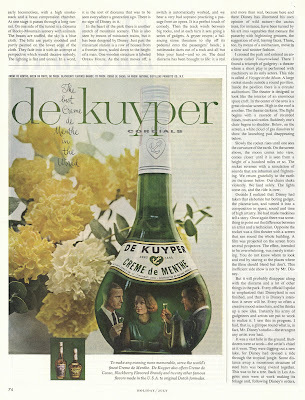 This magazine had no less than a dozen alcohol ads, I suppose travel = money = alcohol? 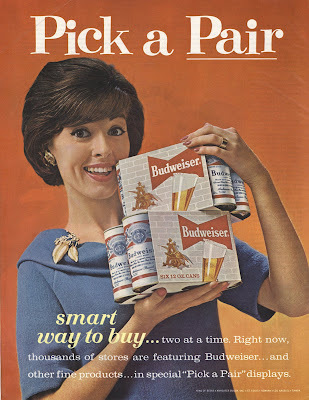 This beer ad is innocent enough; it’s the smart way to buy… two at a time. Is the smart way to drink, two (six packs) at a time? 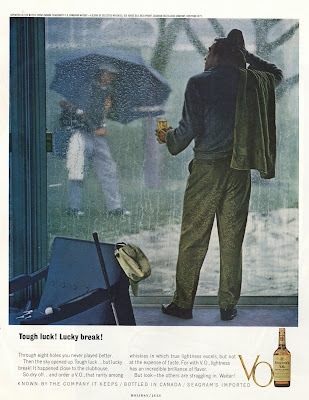 Has the rain stopped your golf game? Drink for awhile until it clears up. 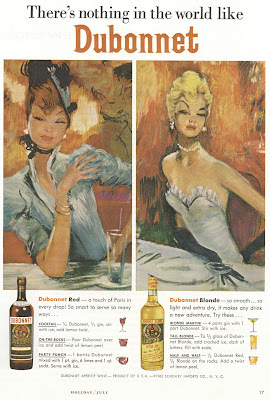 Interesting art work and lots of drink recipes. 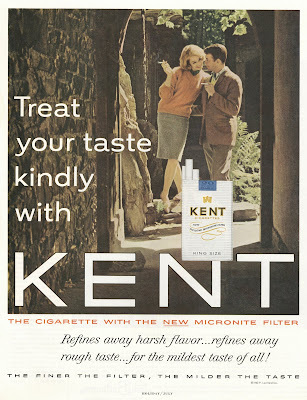 Now that you are completely drunk, why not smoke? Go ahead and forget this: Smoking causes peripheral vascular disease, Smoking causes emphysema, Smoking causes mouth and throat cancer, Smoking clogs your arteries, Don't let children breath your smoke, Smoking - A leading cause of death, Quitting will improve your health, Smoking harms unborn babies, Smoking causes blindness, Smoking causes lung cancer, Smoking causes heart disease, Smoking doubles your risk of stroke, Smoking is addictive, and Tobacco smoke is toxic. With that said, that couple does look ever so cool don't they? 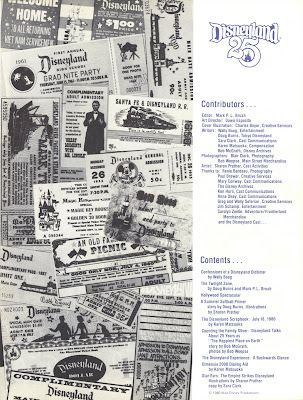 From Friday's post, here's the entire Summer 1980 issue of Disneyland Backstage. The front and back cover together make this painting. Personally it's not my taste, it reminds me of modern oil painting that just don't look right. 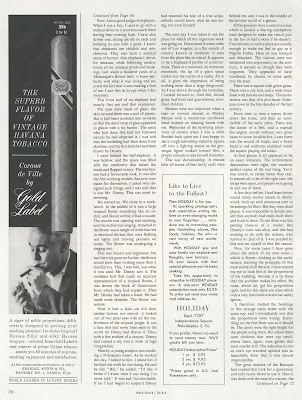 Here's a super article about Wally Boag. See you Tomorrow on Magazine Monday. Today’s post if a bit of a clean up day, I’ve been busy working on the new website, hopefully this weekend I will make some noticeable progress. 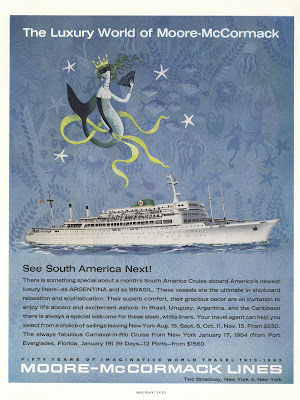 And for some color, here’s another of those 1980’s souvenir slides. 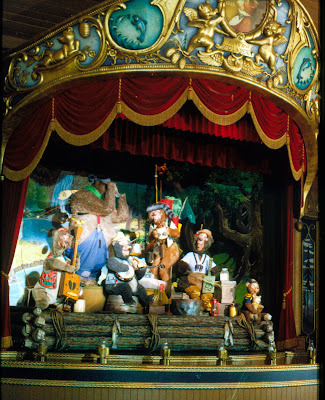 Who else misses the Country Bears???? 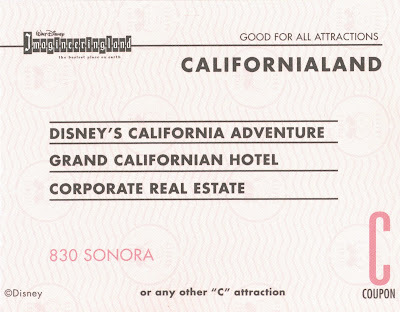 At one time The Happiest Place on Earth had a pretty cool looking gift certificate. 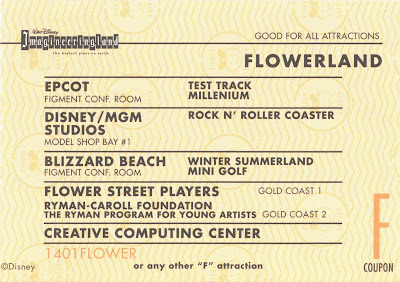 This $10 gift certificate is (say it with me) “undated” but is most likely from the late 70’s or early 80’s based on the “Happiest Place” logo that was used on the back of ticket books from 1977 thru 1981. The back has plenty of those round logos! I like the area to endorse it like it's a check. 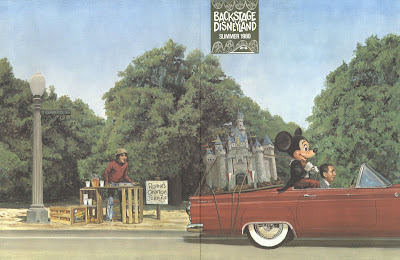 From the Summer of 1980, here’s the cover to “Backstage Disneyland”. I guess this is kind of like the “Disneyland Line”. It has no volume or issue number? 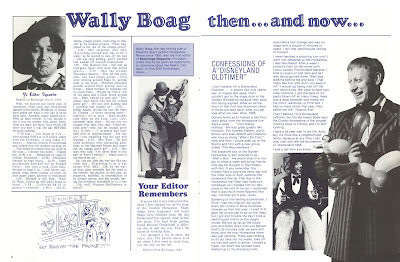 There is an article inside about Wally Boag and it mentions Wally was the first editor of “Backstage Disneyland”. Come back on Bonus Sunday for the entire issue. 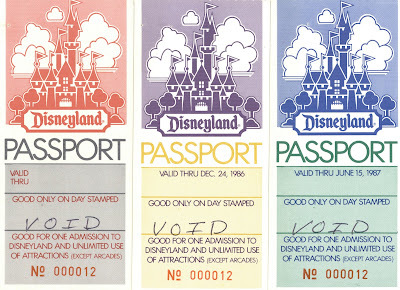 Look what’s on the first page, RARE Vintage Disneyland Tickets!!! First Grad Nite Ticket! 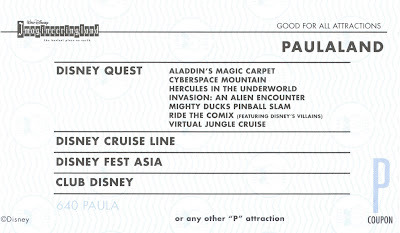 Holidayland Ticket! Mickey Mouse Club Circus Ticket with Stub! 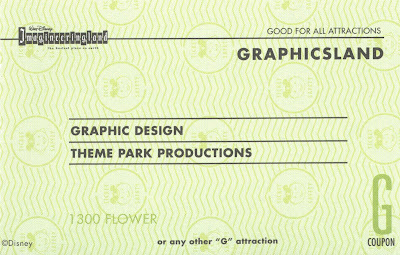 Hey I see a Disneyland Dollar with the same logo as the $10 gift certificate in this post, I’ve never seen one of those before! 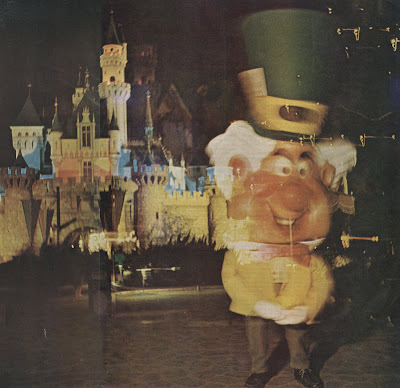 The issue celebrates Disneyland 25th anniversary with some vintage photos. 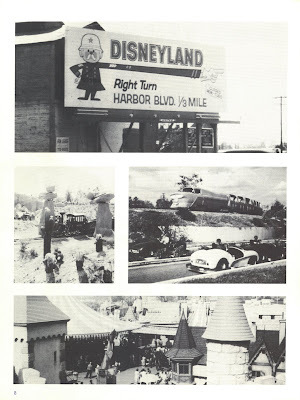 I like the Viewliner shot; I never realize it was elevated that much in relation to Autopia. I have some exciting news. Besides having this blog, I’ve have a website that up until now I have only used as a big storage space for the large .PDF files I post on the blog. I will admit to being HTML challenged and the whole process of creating a website just never clicked. Finally, last Sunday I had an epiphany and HTTP, HTML and FTP all came into focus and I finally understand how to proceed with my website. I’ve got over 480 posts from this blog to incorporate into my new website, so be sure to stay tuned here for anything new. It will take a while to get the website in shape but I wanted to share it from the beginning with my blog readers. In the next few weeks as you see changes to the website, PLEASE feel free to offer suggestions, criticisms or even assistance with making it creative since I still lack in that department. So check it out, its Version .01 so don’t expect much, if anything. In fact, the only part that works is the abbreviated guide books section. Baby steps. Souvenir Saturday - Jiminy Cricket Fire Fighter”.